Different from solar PV, which generates electricity, solar thermal systems generate heat. Solar thermal or solar heating system can be used quite effectively for your home or business. Solar thermal systems work by absorbing sunlight and converting it into heat – you might call it a solar water heater for your home. For mid to higher level temperature applications, a dark surface on the solar thermal collector is used to absorb the sunlight. Technological developments in evacuated tube solar collectors over the past 20 years have resulted in surfaces that can absorb as much as 93% of available sunlight and only reflect a very small amount. The round shape of the evacuated tubes allows for “passive tracking” and improves performance over flat plate solar collectors. This means that solar collector systems can reach efficiency levels in excess of 75%! The task of the solar collector is then to efficiently transfer the absorbed heat to water which is circulated through the panel. Solar thermal collectors are ideal for both domestic hot water and commercial applications where hot water, heating, and even cooling is required. If you are considering a solar thermal system for your home or business, the experts at Sun-Wind can help you determine what your best options are. Contact us today and we will answer any questions you have. With just a few simple questions we’ll be able to determine whether your site is a good candidate for a Solar hot water array. If conditions appear to be favorable, a Sun-Wind Solutions representative can come to your location to perform a no-cost, no-obligation solar site assessment. Contact us today to see if Solar Thermal is right for you. Orientation – An array that faces south is the best, however, west and east-facing arrays are viable, but with slightly diminished efficiency. Shading – Simply put, the longer you have direct sunlight shining on your array, the more production you will achieve. Roof slope – A slope between 30 and 40 degrees is most efficient but not critical, We can suggest a solution that works very well with your given your site conditions. Aesthetics – Clients, especially on residential projects, want a balance between efficiency and aesthetics. They take pride in their homes and want a solution that works and also looks good. Panel Location – Based on clients wishes and the weight of the criteria above. We want you to be completely satisfied with you purchase. We’ll listen to you and provide options to help you achieve the best balance of all the factors above. Investing in a solar water heater system will allow you to reduce your carbon footprint while saving you money. The federal Renewable Energy Tax Credit can allow you to save 30% on the cost of your system. We will provide details of the features and benefits of the system including cost-of-system, expected savings and expected ROI (return on your investment). Each system will vary depending on site conditions but, in general, a system can pay for itself within 3-5 years. Service for solar hot water systems will require changing the biodegradable polypropylene glycol fluid every 2-3 years for good system life. This fluid prevents freezing in the winter months. Our team of solar professionals will work with you and your family to ensure smooth and timely completion. Q: Can solar thermal collectors be used in cold conditions or this far north? A: Absolutely Germany is one of the world biggest users of solar thermal systems and is equivalently as far north as Minnesota. 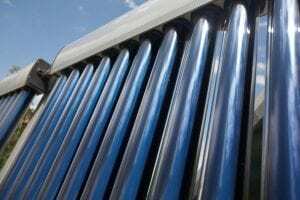 Q: What size solar thermal system will I need? A: The basic rule of 20 gal. of hot water per person per day is the industries “rule of thumb”. Q: Will my solar water heater system work on cloudy days? A: Even if cloudy, during late spring, summer and early fall there will be enough insolation to heat water. There is diminished capacity so your system should be tied to your existing hot water system. Solar thermal can take care of 75 to 80% of your domestic hot water needs. Q: How long will it take to re-coup my cost for a solar heating system? A: On average, you can re-coup your cost for a solar thermal system in 3 to 5 years. Q: What happens if the collector for my solar water heater has snow on it. A: Generally a 3-inch snow or less will not affect the solar collector.